Prefabricated buildings are ideal as either a permanent or temporary solution to the need for more office space and they are durable, robust and very resistant to almost anything that the great British weather can throw at them! Best of all, installing a prefabricated building will ensure that your office space is available for occupation at a fraction of the time and cost that a traditional building would have taken. When you enlist the assistance of the highly experienced team at Modular Direct, you can rest assured that you will be receiving the very best customer service and that they will guide you through the whole process of designing and installing a prefabricated building from start to finish with attention to every detail that will ensure that you are 100% happy with the end product. 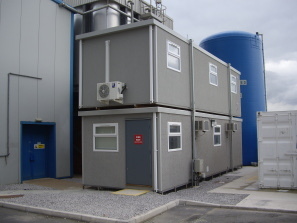 If you have any questions about prefabricated office buildings, you can easily get in touch with Modular Direct by calling them on 01482 881700.